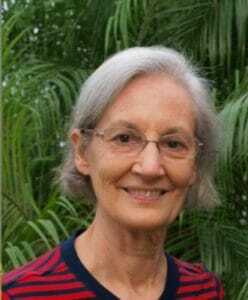 Missionary Nancy Burmeister has been a member of Wycliffe Bible Translators and associate member of Lutheran Bible Translators since 1971. She began work among the Anyi Sanvi people in Côte d’Ivoire (Ivory Coast) in 1973 with her late husband, Jonathan. In addition to raising five children on the mission field, Nancy trained a number of Anyi Sanvi coworkers as literacy teachers and Bible translators. She helped to complete the New Testament and parts of the Old Testament in the Anyi Sanvi dialect. She also helped to build the Alpha Bible Center, where translators and literacy workers were trained for several other Anyi dialects and related languages. Nancy’s current primary responsibility is as bookkeeper for the Côte d’Ivoire field administration, working remotely. She is based in West Chicago, Illinois. Nancy also helps with recruitment of new missionaries in the greater Chicago area.